Airlines are going all out with their first class amenities. With competition being so aggressive between rival brands, every single one of them are stepping up their game in bringing out the best in luxury and comfort for in-flight travel. Although I am of big fan of seeing what new innovations this airlines can come up with, I can’t help but feel that sometimes the price tag that comes with these perks will tend to alienate folks from availing of the first class. Unless your pockets are lined up with money or you’re one of the few lucky enough to gather points and book a cabin for yourself then first class might be a bleak dream. And this is why I find JetBlue Mints first class accommodation so refreshing. It is priced reasonable enough and it sure does not have an air of elitism that is usually associated with first class flights. Let me get my point across to you better by breaking down the fine points of flying with JetBlue mint. 1) Price: Mint’s tickets are very reasonably priced. It might be weird that I’m leading off Price as the first point of the review, but I believe that this is one of its better selling points. JetBlue is making this accommodation available to more people with its pricing, not just limiting to this class to those who are insanely rich. Mint tickets are very well priced, I paid about $1000 for a roundtrip from jFk to lax. This ticket on united would easily run over $3000 and the experience would be lacking. Mint is also affordable from a points perspective. It’s just 90,000 jetblue points for round trip so if you have Amex membership rewards it’s a good transfer partner. You can also check out their prices by by visting their website at http://www.jetblue.com. Their seats com in 3 different rates in currency. The mint private suite is the best offering for domestic first class. The suite does not however make the best use of the space. To your side closest to the window there is a big plastic bulkhead that neither provides storage or is usable as an extension of the bed. The suite seats also have three total usb chargers/plugs which is great if you’re traveling with the av club. There is a good amount of privacy and you can even close the door which is a big improvement over united business first which has seats only in a 2-2 alignment. The moment you settle down on your seat, you instantly feel the hospitality and warmth of the flight class as they provide you with perks and amenities to give you an amazing flight experience. You’ll get a welcome note with large blanket and a complimentary signature drink of JetBlue its vodka infused with honey lime and with a touch of mint. You are also provided with an amenity kit composed of hair styling products, lotions and moisturizers, deodorants and facial wash, shaving cream, lip balm, and more. Products vary from month to month depending on the season and on the brands sponsoring the kit. The supplied blanket/duvet is given to you on arrival and you don’t have many storage options so you’re either stuck using it all flight or need to stow it in the overhead bins. I wish they offered the blankets as part of a turndown experience but on a 6 hour flight the attendants probably don’t have the time. One annoying aspect is you have to stow your carry-on bags in the overhead bins on takeoff and landing so while normally my duffle bag would fit under the seat there’s no option in Mint. On my flight they had the birchbox amenity kit with a bunch of great brands. I used the hanz de fuko hair paste during my stay in La as well as the Baxter after shave gel. The clothes deodorant pads were also really cool allowing you to unstink your clothes right off the plane if you’re headed out. JetBlue mint offers 4 private suites complete with doors for those preferring a bit more along time during the flight. Each Mint lounge chair can be extendable to its bed mode measuring six feet eight inches with a width of 22.3 inches wide. The Lounge chair comes fully automated to adjust to multiple customizable positions. Jet blues entertainment in Mint is definitely lacking. It’s the same entertainment as the coach section and doesn’t have any on demand movies or TV so I recommend loading up your iPad with movies and TV before jumping on the flight. To help you wiht entertainment na dyou device accessibbility, Mint has a personal 110v outlet for your devices with USB port for mobile devices. TheiIn-flight Wi-Fi which was pretty fast before takeoff, it does get a bit slower when you’re in the air. Each Mint guests is also given a Grado SR60 headset for the flight. Movies and TV shows accessible through direct streaming with your device via Jetblue’s fly-fi hub. 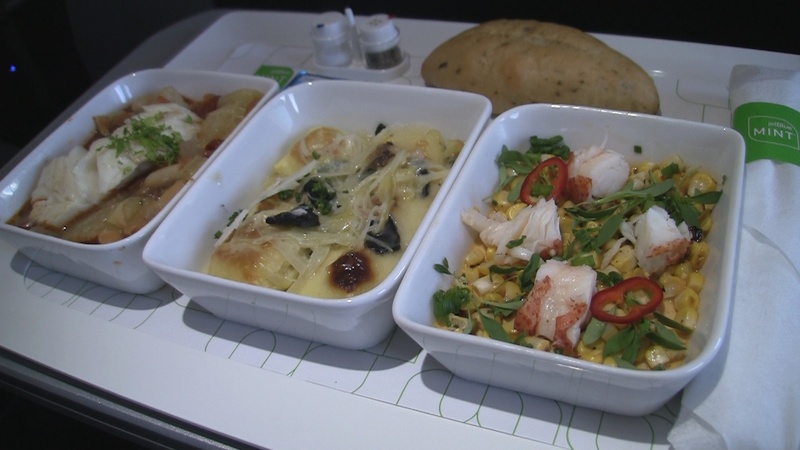 Jetblue offers quite a good menu as well so you will never get hungry as you take your taste buds on a journey too with their varied cuisine. The food is served Tapas style, entitled NOURISHMINT, the service allows guests to choose 3 different dishes as part of its main menu. The menu changes each month offering a variety of servings depending on the season of the year. Mint also has an in-flight cappuccino machine for you to get your caffeine fix. A unique in-flight snack and dessert menu constantly being updated monthly. All in all the JetBlue Mint offers quite a fresh experience for its passengers. Making it affordable just sure does make the experience more enticing for people to try.